We gathered three design veterans (and old friends of 37signals), Richard Bird, Jim Coudal, and Carlos Segura, ‘round the Campfire to chat about “Design: Then and Now.” Topics included their roots/influences, what it’s like to sell your own products, dream projects, control freaks, the loss of craft in design, and how they used to walk five miles to school every day, in the snow, uphill, both ways. Richard Bird’s R.BIRD & Company, Inc. is a New York design consulting firm with more than 20 years of experience in brand identity, consumer product packaging, and corporate ID. R.BIRD also sells limited edition, abstract art at Lavaluva. Jim Coudal’s Coudal Partners works on television, print, identity, interactive, and brand development projects. Coudal also operates Jewelboxing, a source for custom DVD and CD packages, and The Show, home to limited-edition live performances on CD. Carlos Segura’s Segura, Inc. is a multi-faceted design and communications firm that specializes in print, collateral, and new media communications. Segura also sells fonts at T-26 and custom designed blank CDR’s and cases at 5inch. Full chat transcript after the jump. When did you start designing? Any amusing stories about your first gig(s)? i had 3 duties… 1) drummer, 2) drive the truck, and 3) tell people where we were playing. Exactly, Carlos. I, too, was my own first client. Promoting a rock’n’roll band in which I was a member. Without realizing it, I was learning the art of graphic design. Pretty soon, I’m doing the same thing for friends, friends of friends, et cetera. Still, didn’t really feel it was any kind of calling. i got fired on the spot, since he knew i had no clue what i was doing. Carlos, didn’t you used to design the security liners for envelopes? Wasn’t that one of your first jobs? jim, what year was that magazine? true or false carlos: when you played drums, you had a pair of platform shoes that had a fishbowl inside the heel? I got my first professional gig as a graphic artist completely by accident. I was in New York to do some recording with the band. The band leader suggested I bring my portfolio of drawings (I studied studio art) and see if I could find a job to help out with rent. So, on Monday I headed to an appointment with an employment agency and missed the door, accidentally walking into a small husband/wife graphic arts studio. They were frantically busy. I was hired on the spot. Didn’t have a clue what it was all about. Not really. I spent every spare hour I had there in the darkroom, on the board, reading, et cetera. That was my real education. RB — wow, what a great story. The one thing I take away from all of your stories is that great things usually happen by accident. Too much planning and you plan your way *out* of opportunities. I’ve often felt plans are like blinders. Look this way and only this way. Who needs that? Did you have people who influenced you when you began? How have your influences changed over the years? Now that you’re more experienced, do you find you get your inspiration from within instead of from outside sources? the best example of this is the book called "The Pocket Pal". a lot of things that designers are involved with today are often done improperly. Craft is a big problem. I drive myself crazy with the poster ads on the trains. So many things "wrong" in so many dimensions. Is it the rise of computers that’s killed the ‘craft’ of design? Nobody "touches" type any more. You could argue that most people making music today can’t read music. Is that a bad thing? I agree, I was just curious about your take. I definitely see and feel the loss of "craft." I think Carlos will agree — we get what we deserve. We want everything faster and cheaper. There’s no time for craft in most projects. Craft is seen as unnecessary cost these days. Isn’t it your jobs to stick up for it? How much craft do you push back on and say "we *must* do this right?" You guys are the leaders. If you don’t inject craft who will? Of course, we inject craft, it’s just not noticed by the client. We could produce the same "idea" shoddily and it will go. In other words, the craft of design is no longer so much a differentiator. there is a belief that "craft" is an automatic task that comes bundled with the "computer". It IS NOT. But because of it, it is being forgotten, ignored and worse yet, dismissed as "old". Right. Craftsmen are history. Including the likes of Muller-Brockmann, George Lois, Paul Rand and so on. The new design "leadership" are those who draw attention through shock and awe. I understand what you’re saying about mastering the tools, Jim, while there are many who claim to, very few actually do. jason would you say that by and large the cleanest best looking sites most often have the cleanest best looking code? Jim, I think people that want to build beautiful things on the outside also want to build beautiful things on the inside. So those that really care care about both in and out, surface and code. Love that - inside/outside - thing, JF. That’s a good thought. That’s a curse and a blessing. Carlos, you once said, ‘The early nineties was a very energetic period in graphic design as a whole, and there was plenty of acceptance to go around for different points of views.’…The idea of good/bad design cycles, in the same way there are economic boom/bust periods, is interesting. What was the best/worst era of design during your career? What kind of era are we in now? 80’s - best of my experience. Graphic design was a well-respected profession. Our point of view was sought out. Clients competed for our attention. There was a great deal of mystery around what we did and why. sounds very similar to music these days where remixing, mashups, sampling, etc. are growing in popularity. we try to emulate stuff from the past that "mattered"
We’ve seen this from time to time with our products. Someone was so excited that they copied Tada List. But what’s exciting about a copy? That’s saying "I don’t have anything new to offer." heh, when i hear "lust for life" on a carnival cruise commercial or janis joplin selling mercedes benz, it makes me crazy. wtf? this lack of respect for craft blends into the landscape and the by product is that things start to NOT matter. They are seen as "old". i think it’s good for kids to hear people stand up for what they believe in. don’t give up the fight. ok, shifting gears: Between T-26, 5-inch, Jewelboxing, The Show, and Lavaluva, you’ve all got your own products you’re creating and selling. How’s that compare to doing normal client work? Is that something you’ve always wanted to do? Or did it result out of a frustration with the typical client-designer relationship? So the ideal is no client work? So, everything comes full circle… We began as our own clients and will end (survive) that way. Some of the most exciting work I see today is in Industrial Design. If I had to start over again, I might go that way. RB, what industrial design excites you? For all: Any dream clients? Specific design/redesign job you wish you could do? Focus… that’s a great thing. Jim I love that idea. What freedom — to just work on one thing and nail it. any one thing in particular? So much of client work doesn’t allow focus. In fact, it discourages it. And, certainly, doesn’t reward it. That’s a great point, Jim, in so many ways. Years ago, it was not so unusual to be working with one client on one thing for one or two years. That doesn’t happen any more. Our attention and focus is fragmented. So, the results show it. if I was a contractor I could go home open a beer and say "I built that this month"
def something to that though i wonder if it could also be a grass is greener thing. perhaps once you have just one thing to work on you yearn for the variety of diff projects. Something I find interesting though… Each one of you guys owns and runs your own business, yet you’re still looking for ways to run it the way you want to run it. What’s holding you back? You’ll never have more freedom than you have now. "Our…" "Not any more…" This all sounds very unfortunate. Isn’t it up to you? You run your business. or does the business run you? I guess in many ways Jewelboxing, t26, and 5inch are those side projects that allow you to do it the way you want to do it. re: improv…i’ve been seeing comedians live quite a bit lately and i find there seems to be an 80/20 mix that the best ones go for: 80% established material and 20% untested or improvised material. i wonder if there’s something to that sorta formula. keeps cycling in some freshness but have enough trusted material to keep you afloat. Our approach to initial ideation is a lot like that now… allowing untested ideas into the mix. It’s actually been quite successful. RB, you seem to experiment with new processes and ways of working. do clients respond to that? or is it tough to convince them that stuff matters? btw… With T26, it was good to contribute to the industry and change the category. I feel proud of that. CS, what’s been the biggest impact of T26 on the industry? giving credit to designers, permitting relaxed licensing, allowing service bureaus to use the font for output, donating funds to non-profits (AIDS), displaying spreads for each font, creating a "music video" for each font, our limited edition font kits, and many many more, are just a few of the innovations T26 put on the market. JC, what are some new things you’ve learned recently? Carlos, what’s your dream client or (re)design job? What car-related design is most exciting to you right now? Recent interests: Back in 1978, Todd Rundgren and I were the only people on the planet (maybe) writing 3D software on an Apple II. Over the last 3 years or so, I’ve been revisiting design in 3D. Here’s something I’m genuinely interested in… When’s the last time any one of you were a client? What was that experience like? One thing I’ve realized is that being a client is hard. I learned it when I hired some people to work on my house. It’s tough to trust people that can have so much impact on something that’s yours. Oh, geez. I’ve been a client of architects a few times. One very bad experience, one very good. Bad experience: the designers simply didn’t listen to requirements. Good experience: very collaborative. i’ve had only 6 good clients in my career. I define one as "allowing me to do what they hired me to do". I try very hard to do the same when i hire someone. We are "clients" in our daily lives more often than we care to admit. I don’t want to admit it, but way too often. Yes, a control freak. Only recently did my own Mother admit to me that my grandfather said, "Little Ricky’s gonna have a hard time when he grows up… He wants everything to be just so." I was 5, maybe, at the time. common sense is not so common any more, so I feel like i am often disappointed with basic human behavior. i don’t think you can do what you guys do w/o being a control freak. and i don’t think it’s necessarily a bad quality. Certainly. Some of the most respected designers in any discipline are known to be "tyrants" and perfectionists. I just never give them up to begin with! SHIFT: How much do you separate your work from your life? Has that balance changed over the years? Is your goal to integrate them as much as possible or keep them separate? I’m a slob at home… and there’s little evidence of what I do for a living. That’s not at all a conscious decision. Meanwhile, I’ve measured every centimeter of our office in some way. Like Carlos, I work way too hard and too long. So, I don’t too it at home by default. Last one…What’s been your biggest mistake? What did you learn from it? CS, how do you define "importance"? how do I define "importance"? i define it as not doing something for the simple sake of it, and in hopes of making a real difference in the category that I am working in. Even better, if i can do something that will be a positive and helpful solution. Out "cooling" someone is just a simple easy and empty thing to do. JC, what was holding you back? Biggest mistake is ongoing. Somewhere along the line, I’ve become aware of risk. In best of times, the concept of risk never entered my mind. Just go with the flow and things happen. I’d like to recapture that. JC, u sound optimistic about that. as perhaps you should be. Thanks for inviting me guys, it was a fun discussion. Reading it over now I think I ought to say that I do realize that I’m as guilty as anyone of robbing the past to design the present, esecially when to comes to typography. My current torrid affair with Avant Garde Gothic is an indictment all by itself and even when I find myself ‘cheating on my steady’ it’s more often than not lately to sneak off for a quick rendezvous with Didot. What a fantastic chat. Thanks for sharing! It was not only motivational but inspirational. Have a suggestion for a future Campfire chat? Post it here. An ideal suggestion would include 2-3 participants and a specific topic you’d like to see them discuss. Thanks for the chat, it really helps to see it from the perspective of someone who has been doing this for years. Sometimes I wonder if the first year of working for yourself is the hardest. I guess its all the same, you just get used to it! Fascinating. Inspiring. Wonderful to be able to share your thoughts with us. Love it. Good stuff fellas. The Fireside Chats are one of the best segments I’ve seen at SVN. I’d love to hear a conversation with Jake and Jacob of SkinnyCorp/Threadless, and perhaps Rob (or one of the other guys) from Etsy discussing community-driven online marketplaces. Great chat. Very inspiring. Thanks so much to all three of you, and thank you, 37signals, for doing these. They’re really great. Is that the same Todd Rundgren that didn’t want to work, but rather bang on the drum all day? Seth, Yes. Same guy. Todd and I both owned the first and last graphics tablet that would interface with an Apple II, made by Apple. 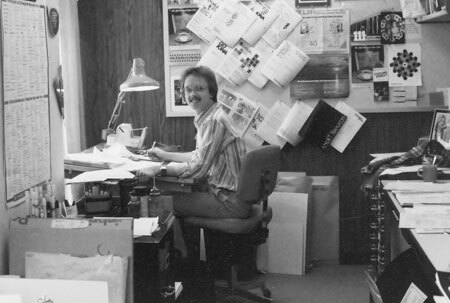 Todd was an early pioneer in “computer graphics,” starting his own company aptly named, Utopia Software, Woodstock, NY. His paint program (can’t remember the name of that) was the only program available at the time that supported the Apple graphics tablet. And a quick look at Wikipedia answers yes. “shock and awe”? I had no idea Donald Rumsfeld was a craftsman and design leader! Another very engaging discussion. I’ve been in the business for some 15 years (also getting into it by accident), but since I’ve usually been part of a small (or one-person) design department and haven’t been involved in many design organizations, I don’t often get a chance to hear other designers talk shop. I really like the informality of the Fireside Chat structure. I’m intrigued by the notion of beautiful inside/beautiful outside in terms of web design (and whatever else applies). I’d love to see a discussion about that. The only person I can think of at the moment to include would be Patric King. Maybe Jon Hicks? Jason Santa Maria? I’m 23 years old. I’ve been ran my own business something about 10 years now. My brains stopped when I read Jim’s quote. I just noticed, that “freedom of working” is just an illusination to me. I have 8/8/8 -rule which means 8 hours working, 8 hours friends/home/alone, 8 hours sleeping. I don’t follow that everyday. But in long-run Yes. If you want to read some further thoughts on beautiful inside/outside, check out the biography of artist Robert Irwin. He would spend a great deal of time making his painting surface (wall, canvas, etc.) perfect so that it was a solid piece. Much like caring about good code and good design, at the same time.